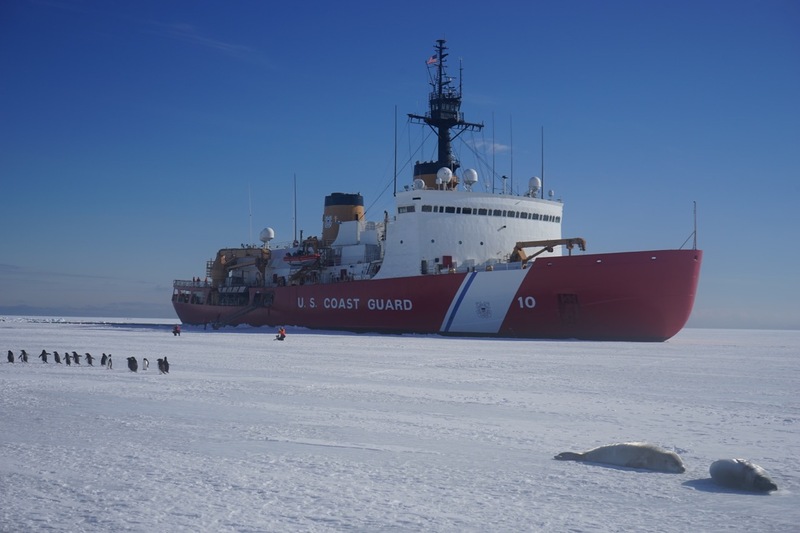 The sixth in a series of dispatches from freelance writer Brandon Reynolds aboard the USCG icebreaker Polar Star, on its annual resupply mission to the research base, McMurdo Station. It's a critical task imperiled by the nation's aging, shrinking fleet of ice-breaking ships. On the lost continent of Antarctica, what has been discovered most are superlatives. Antarctica is the coldest, driest, windiest, highest continent on Earth. It can also be one of the most treacherous, as the recent death of British explorer Henry Worsley underscores. Since the days of Amundsen, Scott and Shackleton, science here has been a matter of feel as much as anything else. Nowadays science is more bureaucratic. It's to be expected when many nations converge on a continent and all stand around pretending they don't want to take it over. The U.S. Coast Guard icebreaker Polar Star once supported science on its missions: releasing weather balloons and buoys to measure oceanic tides and temperatures, that esoteric stuff that's seeking answers to questions you never thought to ask. The National Science Foundation pays for the Polar Star's mission once it drops below the Antarctic Circle, and its priorities now have stripped the science off Polar Star so that now the icebreaker's only job is to clear the channel for the ships to bring food and fuel and booze and equipment and t-shirts, the raw materials needed not just to run a research station and the science that goes on there, but to connect an entire continent. So science doesn't much happen on Polar Star anymore. The shipping container that once housed all the science equipment has become a cigar lounge of the apocalypse, and the onboard lab is used to store bicycles. But science has stowed away, and it looks like toys. The National Oceanic and Atmospheric Administration has attached a delegation to this year's Deep Freeze. The Coast Guard, just like any American in any public park these days, is fascinated by all the drones flying around, and wondered: How the hell can we make these things useful? NOAA's been exploring the use of drones, or "unmanned aerial vehicles," depending on your sensitivity to the word "drone," for counting marine mammals and birds, tracking oil spills, and surveilling protected fisheries. "Aha!," said the Coast Guard. 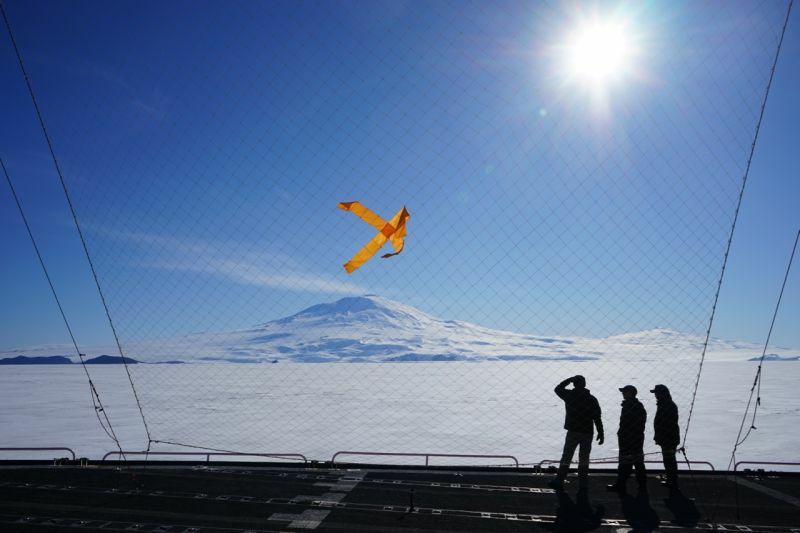 The two agencies have been partnering for the last few years on using drones for those "dirty, dull, and dangerous" jobs, says Todd Jacobs, Project Manager for NOAA's Unmanned Aircraft Systems Program Office. Send the drones to those places where the risk of boredom or death is high. "These are places that you couldn't otherwise get to without unmanned aircraft," says Jacobs. For this trip, the Coast Guard was interested in using drones to scout ice conditions ahead of the ship. In the past, there have been helicopters, which are far more costly to operate. Jacobs and a team from UAV-maker Aerovironment brought some electric-motor-driven gliders with nine-foot wingspans, traditionally used to assess battlefield conditions or silently track, say, suspected terrorists. "I see it as a swords-to-ploughshares kind of conversion," Jacobs says. "To get another life out of them I think is kind of a big win for the American public." The Aerovironment Puma is the big brother of the militarily popular Raven. It can be hand-launched, flown manually or auto-piloted, fly up to four hours, and land on water, which is how NOAA retrieves it after many flights. On Polar Star, a prototype net-capture system has been set up on the flight deck to catch the thing. On the Coast Guard's Arctic icebreaker Healy last summer, the team reports that the Puma flew well and true. On Polar Star, it hasn't done so great. There have been crashes on ice and water caused by wind and other, as-yet-undiagnosed problems, and delays and cancellations due to scheduling issues with the research base at McMurdo Station. The NOAA and Aerovironment teams are frustrated, but they keep patching the birds back together and sending them aloft. 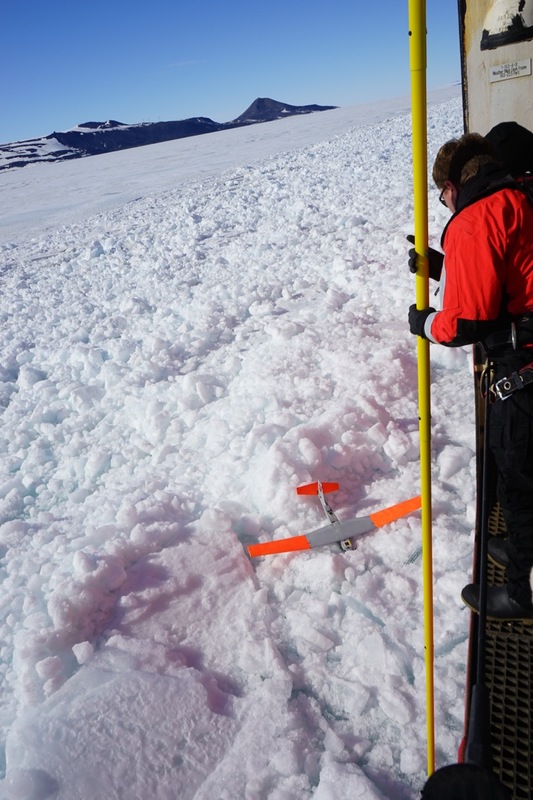 They got it out to 25 nautical miles on one run, which is a pioneering first for Antarctic unmanned flight. If they figure it all out, drone technology could at least supplement some of the dangerous/boring things the helos tend to do and expand the ability to map the continent in real-time. On the lost continent, they continue the Antarctic tradition of discovering perseverance in a place that pretty much wants to destroy all of man's puny works. 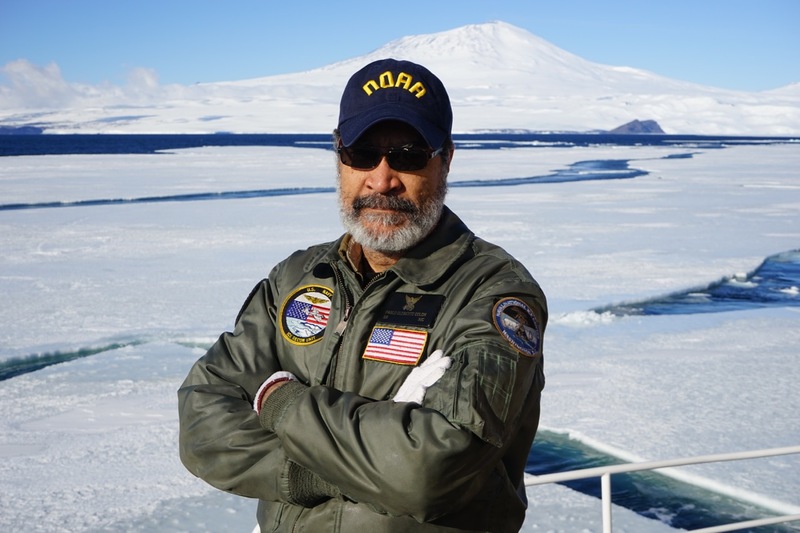 Backing up the Puma mission is another bit of ice science, led by Pablo Clemente-Colón of NOAA's National Ice Center in Suitland, Maryland. Clemente-Colón is chief scientist at NIC and an expert in sea ice, a satellite oceanographer who scopes out the ice condition from far above. NIC analyst Chris Readinger is also aboard. He provides satellite photos to help the crew make navigational decisions, but this is the first time in a few years that there have been people aboard who can read that information and interpret, say, how old the ice is, or how stable. Clemente-Colón has been at it since 1979. 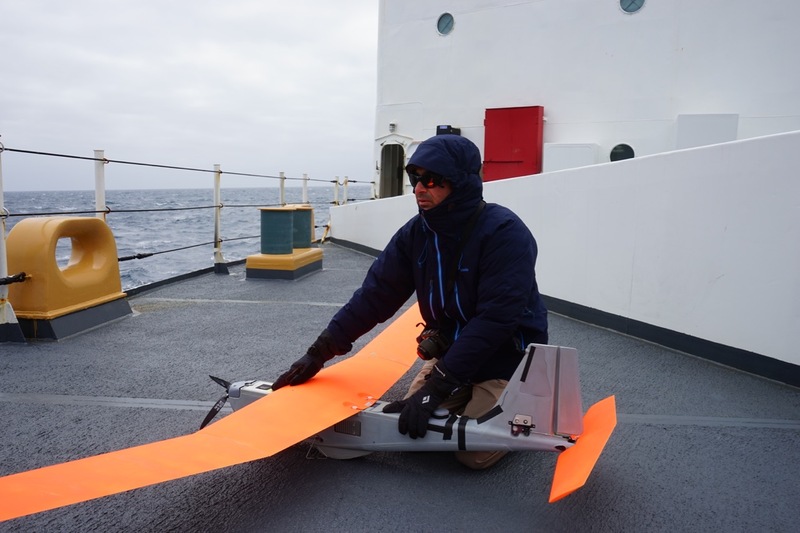 He's spent most of the last decade summering in the Arctic with NOAA, NSF, and the Coast Guard, studying the age and melting patterns of ice. It's not enough to look at how much ice there is. As with most things, the truth is below the surface. "First-year" ice, the two-meter stuff that we're crashing through here, will often melt during the summers, creating open water before refreezing in the winter. Multiyear sea ice, which can be a decade old, is much thicker and less prone to melting, generally. It's more stable. So looking at the extent of surface ice won't tell the whole story, says Clemente-Colón. Sea ice could extend farther than in previous years, but if it's first-year, it's thinner, so the total volume of ice out there is less. "Which means that for the next summer it could melt much more rapidly and you would have more weeks or months of open water during the summer than if the cover contained a significantly larger volume of multiyear ice." That creates positive feedback, he says. "The more the cover retreats during the summer, the more heat is absorbed by the ocean, the more there is a delay in the next freezing, and the less opportunity for the ice to really sustain itself through the years." In the Arctic, these changes are more readily apparent, because it's all ice and no land. 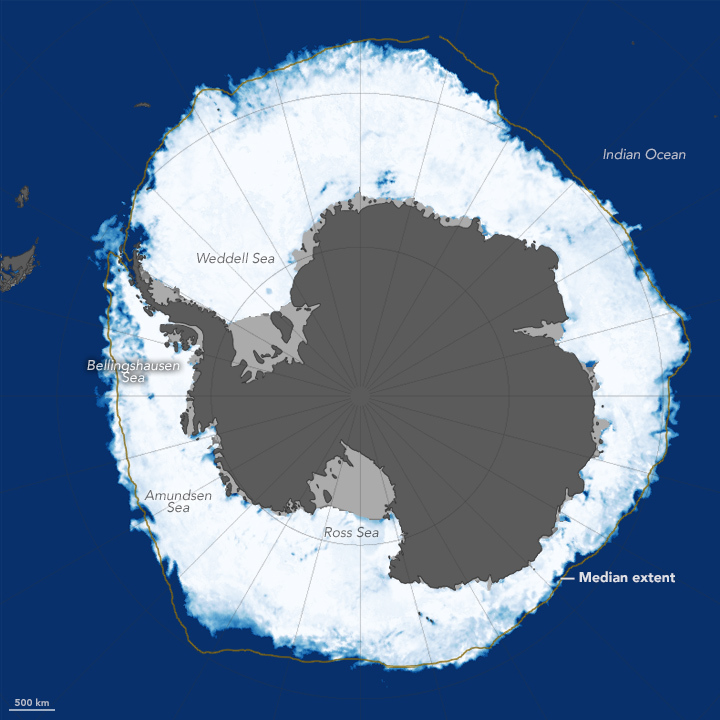 In Antarctica, the giant cap of ice on the continent, plus the circulating Southern Ocean, keeps the system more stable. Don't look here for answers to what all this will do to your local weather. Clemente-Colón says it raises a lot of questions, which are challenges, which seems to be the primary export of the polar regions. "What are the changes in that system? How are those changes affecting the planetary climate? I don't think we're there yet," he says. "Even in the Arctic where we know that the changes are real, it's sometimes difficult to link those changes to what's happening in lower latitudes." Next: Where to From Here? Brandon R. Reynolds lives in Los Angeles but currently summers in the Antarctic Circle. He has written for San Francisco Magazine, SF Weekly, The Atlantic, and Oxford American (not the dictionary).